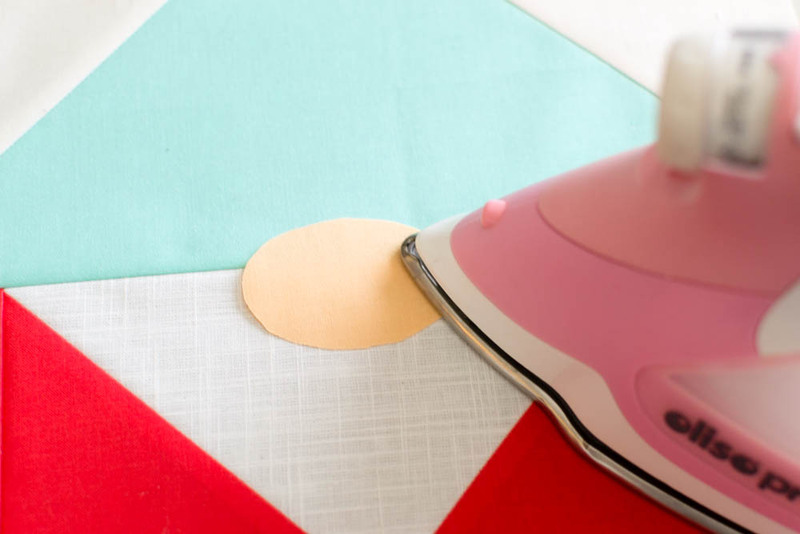 Are you ready to sew up the cutest gnome quilt block ever? Here’s the free pattern for my gnome block (as seen in my Gnome Forest Quilt). This block was inspired by the cute gnome pattern that I shared with you last month. 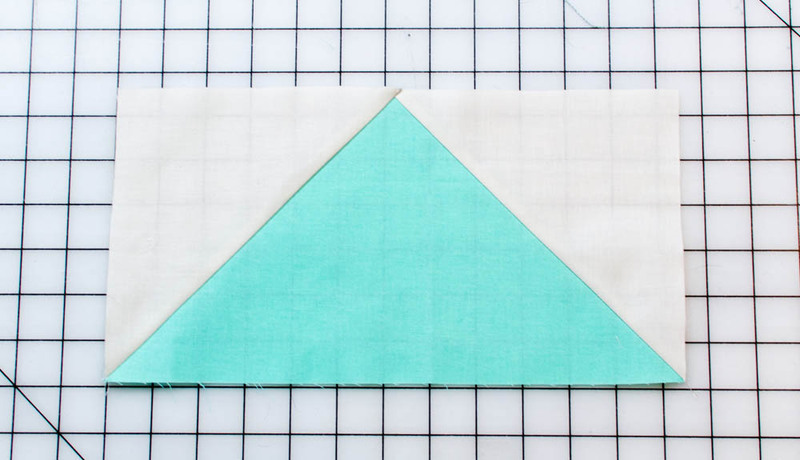 This 12’’ quilt block is made up of flying geese, rectangles, and snowball (triangle) corners, with just a single appliqué for the nose. 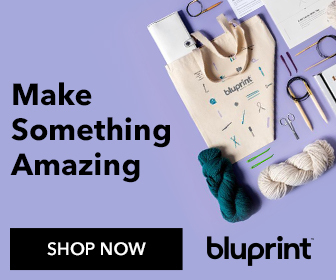 It’s super easy and I’m sure you’ll have bunches of gnomes sewn up in no time! Pair this design with the Pine Tree Block (free pattern coming next week) for to make an adorable Gnome Forest Quilt just like mine! The Free Gnome Quilt Block Pattern (with the nose template) is available for download here. The file includes the applique template plus written instructions. See below for my step-by-step photo tutorial. Almost all of the fabrics I used came from Craftsy’s Boundless Solids Modern Brights collection. All except the white for the beard, lol. My cream background fabric is the color Porcelain, the red is Poppy, the blue is Blue Bird, and the green is Mojito. 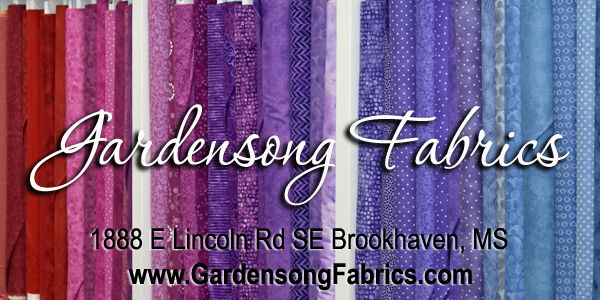 The amount of fabric that you will need depends on how many blocks you want to make. Scroll to the bottom of this post if you are planning to make a Gnome Forest mini quilt like mine. I’ll share a materials list for the entire mini quilt there. For the nose applique: Trace the nose template onto the back of the piece of fusible web for applique. Press to fuse to the back of the skin colored fabric. Cut along the traced line and set aside. The hat section and the beard section are each made with a flying geese unit. 1. Mark a diagonal line on all of the square pieces (6in all). You can use a fabric marking pen, or fold each square in half and press a light crease as I did (see above). This will be the stitching line for all of these squares. Note: the smallest 2 1/2’’ squares are not used for flying geese units, but they will require a diagonal line too so it I find it easiest to mark them at the same time. 2. To make the hat flying geese unit, place one of the 6 1/2’’ squares on top of the 6 1/2’’ x 12 1/2’’ blue piece, right sides together as seen above. Pin along the line. 3. Stitch along the crease or marked line. 4. Trim away the fabric 1/4’’ past the sewn line. Discard these triangles or save them for a future project. Open the piece and press flat. 5. Place the remaining 6 1/2’’ square on the other side of the flying geese unit as seen above. Pin along the line. 6. Stitch along the line. 7. Trim away the extra fabric 1/4’’ past the line of stitching, open, and press as before. The flying geese unit for the hat is done! 8. 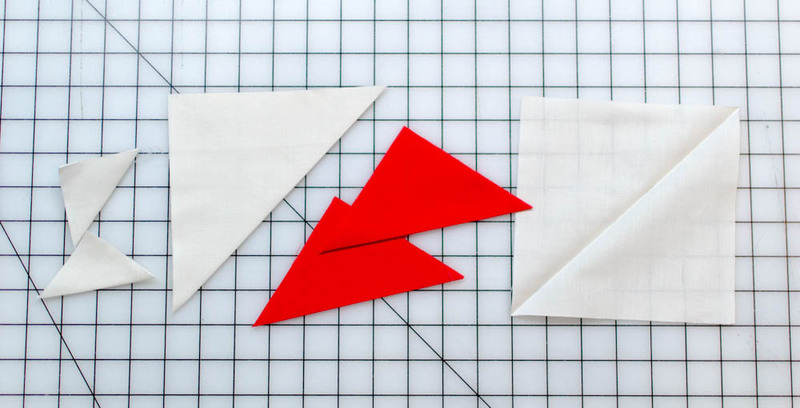 Follow steps 2-7 above with the 4 1/2’’ red squares and 4 1/2’’ x 8 1/2’’ white rectangle to make a flying geese unit for the beard. 1. Pin the 2 1/2’’ cream colored squares to the ends of the 2 1/2’’ x 12 1/2’’ rectangle, right sides together. 2. Stitch across the creased or marked line. 3. Trim away the extra fabric 1/4’’ past the line. 4. Press the triangles open. 1. Sew the red 2 1/2’’ x 4 1/2’’ rectangles to the sides of the red and white flying geese unit. 2. Arrange the block in three rows as seen above. Stitch together. 3. Remove the paper backing from the nose applique piece. Press to fuse it in the center of the block, mostly on the beard, but with some on the hat (or as desired). 4. 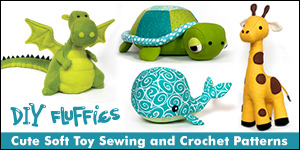 Sew the nose to the block using your desired appliqué stitch. I used a simple line. My 33’’ Gnome Forest Mini Quilt above contains four 12’’ blocks plus sashing and a border. 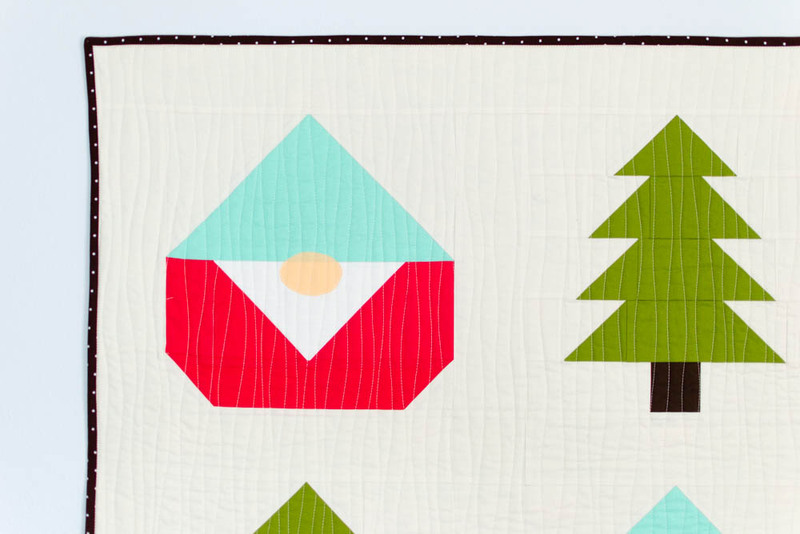 Click here to see how to make the tree blocks and finish your Gnome Forest Quilt.